Introduced in April 2011, the pupil premium is allocated to children who are looked after by the local authority, those who have been eligible for FSM at any point in the last six years (also known as Ever 6 FSM) and for children whose parents are currently serving in the armed forces. 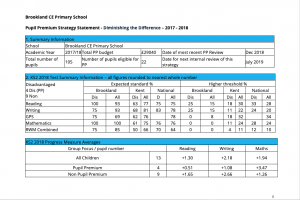 The level of pupil premium is currently £1320 per pupil for the academic year 2017-2018. Pupil premium children have a wide range of needs which affect their learning as do all children across the school. Pupil premium funding is used to minimise the identified barriers to learning in order to maximise pupil potential. Pupil Premium children may experience limited access to activities which have a cost to them. The pupil premium money is used to minimise this. Financial constraints that limit parental training and self-development due to child care costs. Financial constraints that limits pupils experience of wider opportunities. At Brookland CE Primary School we treat each child as an individual. Their needs are assessed as soon as they enter the school and are reassessed on a half termly basis during pupil progress meetings. This is a holistic approach; it identifies children who require support academically, socially, emotionally and financially. Children who receive pupil premium funding are highlighted in these meetings and the funds are used to target individual needs. We also monitor closely a group of children the school feels are vulnerable to becoming eligible for future pupil premium funding due to family circumstances. When identified the school will endeavour to support these children in order to improve their life chances. We recognise that not all pupils who are socially disadvantaged are registered or qualify for free school meals. We reserve the right to allocate the pupil premium funding to support any pupil or groups of pupils the school has legitimately identified as being socially disadvantaged. Pupil premium resources may also be used to target able children on FSM to achieve working at a higher level at the end of KS1 or KS2. Providing small group work with an experienced teacher focused on overcoming gaps in learning. Additional teaching and learning opportunities provided through trained teaching assistants, teaching staff or external agencies. Providing opportunities for young people that they may not otherwise have access to. Providing appropriate intervention programmes in literacy and maths. Providing support to socially disadvantaged children that are not making the expected progress and to help ‘diminish the difference’ for those pupils. To ensure that children in receipt of FSM are not excluded from school trips and visits. Therefore FSM children be partly or fully subsidised. To ensure that children in receipt of FSM get three healthy meals a day. Therefore FSM children are able to attend Breakfast club for free and After School Club for a reduced fee. 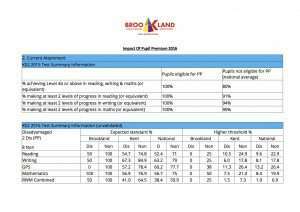 Pupil data will be used to measure the impact of interventions put into place on a six weekly basis. Leadership will monitor, challenge and evaluate the impact of interventions during pupil progress meetings. Emotional, social, academic and behavioural interventions all ultimately impact on children’s academic progress. However, emotional, social and behavioural strategies may take longer to influence a child’s work. The impact of these interventions are measured through progress meeting discussions and records kept by the SENCo.